The Allies are making steady progress, slowly pushing Napoleon out of the German states. A meeting of emperors and princes has been planned at Emmenhagen in two days to discuss the next phase of the war. Near the front line, the site was chosen so the Mighties can show their fearless disregard for the French to any who care to notice. Napoleon cared to notice. Once he received word of the Coalition's assembly he decided embarrass them and capture the town. It is also of some military significance as the roads passing north and east through it head directly to two of the allied armies. Napoleon has sent his adopted son, Eugene, with his IV corps to capture the city. Russian General-Poruchik Nikolay Tuchkov has his deployed south of the Emmenhagen. No contact between the two forces has occurred yet. Precise sizes and possible lines of march are unknown. A meeting, though, is inevitable. This 3 hour battle will be fought on one of the Antietam maps, (Fox's Gap), so it will be necessary to have that expansion pack. The map has been modified to remove much of the forests and remove the speed and fatigue penalties due to the many wooden fences. Their defensive bonus has also been eliminated. The usual 3 mods, Road to Wagram, KS SOW Supplemental Maps and KS Napoleon mods will be needed. The standing rule that no player can scout more than 200-250 yd. in front of their troops will be in effect. We will need a minimum of 8 players. Of course more players can be accomodated with brigade commands. We also need two volunteers for CinC. The CinCs will be able to command their own troops if they like and not be too disadvantaged. The competition for these coveted positions is fierce so don't delay in stepping forward. If I can have enough players so I don't personally have troops to command, I'll take Eugene. I've had an unnatural and insatiable craving for Malossol Osetra Russian Black Caviar lately. Either I'm having a baby, or channeling Nikolay Tuchkov. The latter is less painful. And we didn't even need nominations from the floor. Well done gentlemen. Briefings will be going out. It just occurred to me that a few GCM'rs may not have played on the Antietam maps before. If they purchased the expansion from Matrix they will have been given an older version of the map files. Wednesday showed us what a problem that can be. So I have uploaded a new version, (1.03) of KS SOW Supplemental Maps. It has all the correct files so everyone will be on the same page. Everyone still needs the Antietam expansion pack, but this fixes the different versions floating around out there. Is this game today rather than tomorrow Kevin? If so what time please? The game will start at 20:00GMT today. Lets meet early so we can be sure everyone has the new supplemental maps mod installed. I am taking my sons to the NFL experience this morning so I may be a little late, around 30 mins or so. Or I could be on time, just don't know yet. Hopefully will make it back in time to take a command! This scenario was constructed to challenge the players with a situation where both armies are hurriedly responding to given orders. They have not been given time to properly gather information as to the enemy's location and size due to the late arrival on the field of the cavalry.. Also the forces of both armies are somewhat dispersed. Oh, and the two forces start much closer together than the CinCs were led to believe, (an inadvertent oversight by the scenario designer). It would be a battle where any detailed planning by the CinCs would most likely prove worthless and they would need to spend some time gathering new intelligence and coming up with a new plan on the fly. In the meantime, due to the proximity of the two armies, the division commanders would largely be on their own to fight the battle given only the local conditions they could actually see. I can happily report that is what happened and that everyone recovered and responded extremely well. It was three hours of nonstop fighting that felt like one, where very few if any mistakes were made by either side. In the end the casualties on each side were virtually the same. Although the Russian army was beginning to fall apart, they still held Emmerhagen at the end. I commanded the smallest division of the French army, Mortier's 4th division, composed of 8 battalions and two 6 gun batteries. I was ordered to move north along with Rozniecki's, (Matt), cavalry. We were to move north as rapidly as possible to the vicinity of Emmerhagen where our CinC, Eugene, (Martin), felt we would find few Russians. He was right, they were all down south. I had just started my men marching cross country to Neuershausen when I heard artillery open up to the north. Our cavalry, which was proceeding north in advance of my division had stumbled upon a Russian defensive line just north of the Eltz Fluss. As my men approached the low hills overlooking the river, I watched our 7th cavalry brigade, (MacLeod), attack the Russians, temporarily capturing several guns. As my men arrived and deployed, my guns went into battery to begin bombarding the Russians. No more than one or two rounds were fired, (this would become a common theme in this battle), when the Russians withdrew to a line of stone walls at Neuershausen. The Russians were obviously planning to make us pay a heavy price if we truly wanted that town. Matt and I conferred and we agreed that we would roll up the artillery and begin reducing the enemy battalions. Then I would advance the infantry closely supported by the cavalry to force the Russians into squares. We would again advance the artillery and along with the infantry, shoot apart the helpless enemy. This procedure was to become another common theme in our battle. I had judged the Russian left to be their weakest part and brought one brigade up to flank the enemy while my second advanced on their center. With the cavalry just a few paces behind, the Russians had no choice but to form several squares which the guns and infantry promptly began attacking. The Russian commander, (Mark), realized his situation was untenable and began the most difficult thing a commander can do, disengage from active combat. He would become expert in this by the end of the battle. The cavalry attacked targets of opportunity, battalions caught in line or falling back, but we could not hold the Russians in check. We chased the enemy north to the town of Landengenslingen. There we were stopped dead in our tracks by a much more dangerous foe, a large contingent of Russian cavalry. Another exchange of messages between Matt and I and we decided to once again bring up the guns and begin the slow process of reducing the enemy's numbers. Normally I have found that guns in front of the line present an irresistible target for cavalry commanders. I had stationed infantry behind the guns, ready to bring them forward to protect the gunners with a square when the inevitable charge came. Unfortunately the Russians were commanded by Niall who as an experienced cavalry commander was having none of it. As the guns began to pour in canister he kept backing up to get out of range, obviously buying time so the Russian infantry could establish a new line farther north. Matt was slowly working his cavalry towards the Russian right when, like magic, the enemy cavalry withdrew and moved north. My division followed closely only to see a few hundred yards beyond that a new and much more solid defensive line had been created. I wasn't at all sure how to crack this one. Much to my relief, I looked over to my right and I saw our other two divisions had finally arrived and could support the attack. So Matt and I could go back to the task of breaking the Russian right. Just as my infantry and guns were moving up to repeat what had now become standard operating procedure of blasting the enemy line apart with artillery, the Russian cavalry launched a furious attack upon our own. Even Niall has his limits and anyway that's what cavalry does. I decided that part of the field was better left alone so I repositioned my men to stay out of the fray. It was an inspiring thing to watch, if for no other reason than I knew at the end, there would be far fewer Russian cavalry to threaten my men. Matt's cavalry was successful in driving off the enemy, so it was back to business as usual. With the majority of the Russian cavalry threat removed, I moved my men onto the cavalry battlefield and began flanking the enemy with infantry and guns. With the cavalry again right behind the line, the Russians were compelled to form squares which were mercilessly punished. Again the Russians fell back. Now Emmerhagen was finally in view. Unfortunately in front of me were a large number of Russians. By this time my force had dwindled to five battalions. Even with Matt to help, I did not see how we could break this line. I sent a message to Martin requesting support. The reply came back stating that an attack on the other wing was being carried out that would hopefully siphon off Russians from my front. CinCs can be so disappointing. Once again I brought up the guns and infantry to where I judged the weakest part of the enemy line to be. This time it was the Russian left. Their forces had again split and two separate battles were being fought. With Matt's cavalry keeping the Russian right fixed, I slowly wore down the enemy and they began to give way, not in a final retreat as I hoped, but only far enough back where they formed yet another tedious line. The rest of the corps was now well to the NE of me where they were overwhelming the enemy on the outskirts of the town. The cavalry and the remnant of my division again brought up the artillery and began shooting away the enemy line. This time the Russians pulled back in haste and disarray. I felt they had reached their breaking point. They were in the process of trying to establish one final line when the battle ended. It did not seem like three hours. It was a great fight, one that all the participants can take pride in. The Russian defense was extremely tenacious, just like one would expect from Russians. The French attack was continuous with no let up, again just what one would expect. Inspection of my new division failed to lift my spirits. The rank-and-file were comprised of the unwashed sweepings of Smolensk, St Petersburg and Moscow, and the officers were little better. My dears, I failed to detect even a whiff of eau-de-cologne. Of my two brigadiers, Zheltukhin was much the better. I had remorselessly bullied him at military college, and was confident he would display no initiative. The father of the other, Laptev, had made his money from trade, so I anticipated trouble on that front. Initial orders were to march NE towards Guntelfingen. This we proceeded to do and soon discovered a column of enemy infantry moving parallel to us to the east. They disappeared SE for a while, then reappeared in greater force, and attacked from the east. We took position on high ground, unlimbered the guns and received their attack. This was a good position, but Laptev daringly moved off it, and down into the valley, to counter-attack. A certain boldness is becoming in a gentleman of quality, but in the nouveau-riche it is merely vulgar. Lipatev was placed under close arrest, and remained so for the remainder of the battle. To my great regret he survived it. The French attack was driven off, assisted by Likhachev’s Division which arrived from the NE and took station on my left. Together we then pivoted front to the S in time to repulse a second attack from that direction. The French now withdrew to long range. Our guns were again in a good position, and Likhachev (Soldier) and I found time to take snuff together. I found him a good egg, even though he had spent some years in the Americas, poor fellow. Things were apparently not going so well on our right, and orders came to pull back to a previously-agreed defensive position SE of Emmenhagen. I was reluctant to do this as our guns were still doing good work, but eventually did so, following Likhachev’s Division back. This delay was an error on my part, and I was fortunate to escape being cut off. I would fully have deserved censure from Tuchkov in such an event. Shortly thereafter I was ordered into reserve behind Likhachev, and soon after that over to the right. As I moved away from him, I could see Likhachev was facing a large enemy force. I decided to leave one of my 2 batteries to cover his exposed right flank. This also proved to be a mistake. I was ordered to send a battalion into Emmenhagen to secure the objective against a cavalry raid. I was to advance SW from the main road with my remaining troops to bolster our right wing. Things initially went well. I was not facing strong enemy forces and advanced to a gentle rise, where I unlimbered my remaining battery. These did some good work against enemy cavalry to my front. Some of these charged, and one charge penetrated my gun-line, but was beaten off. At this point I sought to bring up my second battery, but the French had by now penetrated between myself and Likhachev, so the couriers failed to get through. I thought about riding back to send a message in safety, but with the infantry under constant cavalry threat, felt that I must remain with them. I believe the battery I left with Likhachev did some good work, but had I kept it with me, I would have had a more balanced & powerful force. Pressure was now mounting as the French brought up additional guns, and also infantry which advanced against my left flank. Cavalry still threatened my front, but most seemed also to move to my left. I was surprised at how well our infantry responded when under cavalry attack. I was normally near enough to put them into square, but one one occasion a battalion in line fought off a charge, by French cavalry who came on in quite splendid style. I understand that our Russian infantry are notable for their stolidity. In my view this is a much overrated quality. My sympathies in this affair were entirely with the French! Nevertheless I found this combination of all arms difficult to deal with, and casualties were mounting. I attempted to counter-attack their guns, but this exposed my infantry to cavalry attack and I lost a battalion. About this time, Tuchkov asked me to send troops to protect the road into Emmenhagen, some way to my left rear. I was by now feeling exposed in too extensive a position. I nevertheless thinned out my front in an attempt to cover the road. A couple of French battalions had actually penetrated our front and advanced to the outskirts of the town, and I sent further troops to deal with them. I realised that this situation could not continue, and ordered my entire division back in haste towards the town. The enemy initially pressed us hard with cavalry, and we lost more battalions and some guns. The French pursuit then appeared to slacken, and the remainder of the division concentrated just S of Emmenhagen and began to form a new line. Darkness fell at this point, and I must admit to a feeling of relief, although I have since learnt that both armies had suffered severely. The remaining men were in surprisingly good heart. I put this down to my riding along their lines and ostentatiously taking snuff when the fighting was at its heaviest. It is with such trifles that men’s hearts are won. During the evening I rode into Emmenhagen to sample its delights. It is without doubt the grubbiest little place in Germany. The surly inhabitants confirmed that some French cavalry had passed through earlier in the afternoon, although I did not see any on my travels. The only evidence they had been there was a half-eaten baguette, and some graffiti on the walls of the Rathaus - in execrable French, I might add. As Gral. Ledru woth 7,000 men and 14 guns, I was instructed to proceed fropm Hochsteten to Guntelfingen through St. Peter. When arrived to this last named location I met Russian cavalry, they about faced and moved following the road. My second Italian division was some 500 yards to the west moving north on the valley road, I called them closer to me just in case the enemy lancers might take their chances. New orders came to move straight Guntelfingen as an enemy division was moving northwest towards that town, I should try to cut their retreat. I left the road north of St. Peter, cresting a ridge, with my troops on my left to avoid enemy artillery around Guntelfingen. On my rear left I saw a column of guns moving north using the same road my Italians had left 5 minutes ago, the sprites confused me and I thought they were French! Shortly afterwards, Russian infantry showed to my west cresting another ridge, I thought I had an opportunity to chase the guns and hit the Russians hard. Not a wise decision knowing there was cavalry to my north and that my guns were a bit late and couldn't support. By the time my leading brigade was closing on the Russians, they had formed a line on the slopes and were deploying their guns, their infantry felt the pressure, but they had guns, my line was very long so I couldn't see all my battalions and Russian cavalry was coming from the north. The most timely order arrived from Martin Diggers our CinC to pull back before things got worse, without that I would have been completely annihilited as (I didn't know before the replay) Mark/Sodier's division was coming to attack me from the rear. I disengaged my troops in better shape that I expected before hand, but my spirits were at their lowest, with two battalions lost to enemy cavalry. A staff courier arrived, with orders to move west arround the Russians starting for the south. It added something like "Well done you kept the attention of 1 or 2 infantry and a cavalry division". It was reassuring to read that, and think that my men had died for a purpose. When I told my men that we were going to join the Corps for the last push on Emmenhagen morale rose again within the ranks. After a short rest, the 10èmè Division moved "en bloc" towards Hochsteten, I tried to get a hold on the southern tip of the ridge where I had been fighting so to cover Mike/Grog's division approach march as I colud see his columns moving from the south. My troops had hardly arrived when two Russian brigades were closing in and deploying a battery 200 yards up the hill. I colud feel breath of the always bloodthirsty Mark and Martin James competing to see who got to kill more of my men. This second disengagement cost me another battalion and 4 guns shot up. Finally deployed on a knoll east of Neuershausen and somehow helped Mike troops to move to join the Corps. The enemy was moving north-northwest to help their comrades covering Emmenhagen as their cavalry had done before. Even after 2 setbacks my division could field 4,500 men and 10 guns, I was ordered to move north and keep busy as many troops as I was able to. we advanced almost to the Guntelfingen-Emmenhagen road and deployed. I was surprised the Russians had so many troops to the northeast of my position, between my front and to the east at least 3 brigades and 3 batteries, little by little they moved northwest. So an order came to put pressure on the enemy to my front. I fought a Russian brigade and forced them and a battery to retreat. Our CinC Martin was urging to keep on the move, but I wanted to at least deploy my guns before engaging. The last order I got was to press hard on the road to Emmenhagen and support Mike's troops, forgetting about some battalions to my right. I had to dislodge a Russian battery that would have enfiladed my men with one brigade and sent the best one with all the guns to push hard, when I was bringing my second brigade in, the bell rang when I felt my troops were doing better against the Russian hordes. I didn't remember that there was a 3 hours time limit. What the hell! I couldn't have told how long the game took either real or ingame! I would subscribe all your comments about the scenario Kevin, well done, superb scenario. Having such a line-up "all stars" of experienced players is making games more and more interesting. Thanks to all players! Martin wrote: ...and orders came to pull back to a previously-agreed defensive position SE of Emmenhagen. I was reluctant to do this as our guns were still doing good work, but eventually did so, following Likhachev’s Division back. This delay was an error on my part, and I was fortunate to escape being cut off. I would fully have deserved censure from Tuchkov in such an event. My Chief of Staff was told to begin preparing the papers, but in the end I didn't have the heart to have the good Count Kaptsevich written up. He was having such a good time up in those hills! I figured the würst & bier garten in St. Peters must have been truly exceptional to risk spending quality time on Devil's Island as the guest of Mssr. Bonaparte. A great battle and strong performance by all involved. I was very happy with the stubbornness shown by the Russians. Each division commander met and overcame serious challenges. Most of all, the entire event was hugely entertaining. Seldom does one of our battles run the full course and come down to the wire with both sides in position for victory. I think everyone was shocked as I was to see that End Game screen. Very absorbing. In the end I'm not sure how much we impressed the observing Allied Crowned Heads. Quite probably, they had long before booked every available carriage in Emmenhagen for an expeditious vamoose. Another 15 minutes of game time might well have done us in. ......I figured the würst & bier garten in St. Peters must have been truly exceptional to risk spending quality time on Devil's Island as the guest of Mssr. Bonaparte. Yes, a terrific battle. Great scenario from Kevin, with scope for manoeuvre by both sides, and a really close game. All played in the usual excellent KS spirit. Well done everyone on both sides. This fierce battle was probably the most enjoyable and well played battle I've been part of since taking on this addiction. For the second time, I had command of Cavalry, the French this time (much more enjoyable than the peasant prussian horse arm). 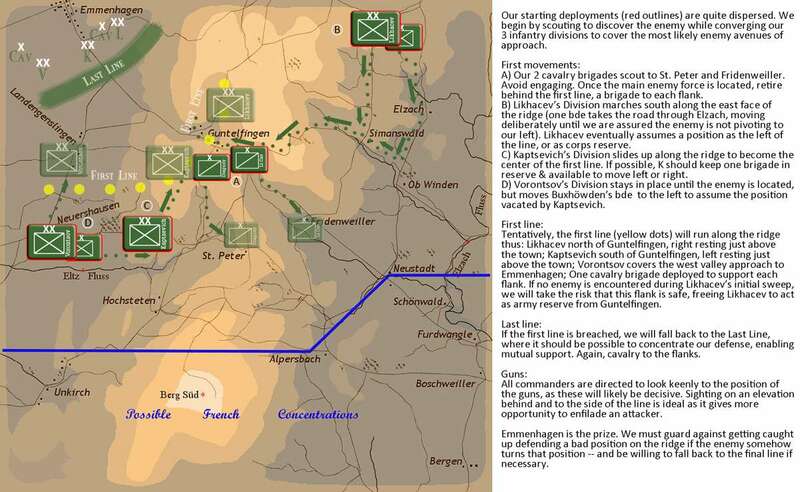 Interestingly enough, there was very little maneuver from my division as we ran into the Russians very quickly and proceeded to advance north in small increments time and again working closely with Mortier's/Kevin's infantry division to methodically reduce the Russian division opposing us. All totaled, the division including the Brigade commanded by Macleod, captured around 14 guns. We inflicted fearful casualties on the Russians and still had several squadrons in the field when sunset brought the action to a close. The highlight of the game probably occurred when the Russian cavalry division arrived to our front and a stalemate developed with our cavalry deployed in a long line wrapping their right. These two powerful mounted formations stared one another down with neither blinking for a considerable amount of time. Mortier and i brought our guns up and inflicted fearful casualties on the Russian mounted arm. Finally, a few Russian squadrons advanced and I countered with a few of my own until a swirling cavalry melee was engaged from which i believe the fine French horseman came out on the better end of the sharp fight. The low point of the game was when one of my squadrons of Empress Dragoons (i think!) charged a Russian battalion in line formation and was routed off the field by them. Russian steadfastness indeed. Mark, commanding the Russian division facing Mortier and I, handled his troops about as adroitly as can be expected. Delaying us, falling back, forming a new line, rinse and repeat until such time as additional Russian divisions and cavalry could be brought against us. I assume his division was destroyed in the process, but he really did well on the defense and made nothing easy for us at all. The battle ended with nearly even casualties and the Russians still in possession of the town. Macleod had actually entered the town and taken the objective with his cavalry, but finding no Russian high command there, abandoned it as a fool's errand. In the end, both sides fought well and hard and only the sunset brought this battle to a close. I am really beginning to enjoy commanding the cavalry as it's sort of an art form to use them correctly and efficiently. They are devastating when used properly, though they are fragile and the threat of them is nearly as important as their actual use. I look forward to commanding them in future battles....well...not so much Prussian cavalry, but certainly French or Russian. Kudos to Kevin for what turned out to be a great scenario. It was a real pleasure to work beside him in close support. Yes that was me facing you; thanks for the praise MJP. The battle started with French cavalry overrunning my cannon almost as soon as I had their commander TCed: not a good start at all. I managed to recapture 7 of them and withdrawal them to the rear. I admit I was rather peeved, as our battleplan had me sliding brigade east to cover the initial starting position of Martin's large Russian division. I was in the process of this redeployment when caught in the open by French cavalry. I managed to capture a squadron or two and cause several to rout, so despite my loss of guns I was up several hundred points. I could clearly see that my initial defensive line was absolutely indefensible. I managed to extricate my division and found a reform position behind some stone walls on the crest of a tiny rise. CinC Palmer joined me there, as I had been firing off several less savory messages; essentially blaming him for my predicament. I had to really focus and set up a defense. I knew my left was weak, so I positioned several battalions in reserve on that sector. The damn French dragons I had initially tangled with were riding behind my lines, so I had to leave a battalion in square to support the rear of my guns. For perhaps a half hour, I watched the French dink and dunk across the field. Spreading out like peanut butter across my front and poke me for weaknesses. 18 guns in three batteries pounded my infantry, who were luckily hiding behind walls and suffered only about 70 casualties despite 30 minutes of canister! I saw French infantry shifting to my left flank and knew time was up. I planned to disengage like a checkerboard, square by square. It was tough fight, and I had to sacrifice a battalion but I was able to get about 2250 of my division out of that fight, and set up yet another line, on a hill, on a stone wall. I set up my guns and went to work. I was busy rallying my men and did not see much of the cavalry battle. This time my right flank was weak. I could not stretch my frontage as I had before. What did me in for this third position was the Russian division to my left never connected to my line. Essentially I was on the military crest of the ridge and they were on the reverse slope. Which did me no good. I was killed twice and fought my regiments to the death. That was the end of my division. I was able to see our army forming another line of defense so I knew every second I held was valuable. In the end, I had one red flagged battalion that beat back a cavalry charge and two infantry charges before finally being routed by yet another cavalry charge. With that, my part was done. It's great stuff to read all those fantastic reports! I'd also love to see some screenshots of such a memorable battle. Like nearly every battle I play in I record it with FRAPS. Unfortunately my PC has real trouble processing the resulting huge files and always overheats when I am converting the final win media project to an MP4. I don't know what to do about this other than upgrading my PC which for reasons of finances is out of the question for now. Alright, alright. When you've stopped laughing I will explain. News had been received of a conference of princes and other international leaders to be held at Emmenhausen. Apparently this was being done to spite the might of France in that the Allies were claiming they could hold a prestigious conference of mighty personages so close to our armies. This taunt was too much for Napoleon who ordered his adopted son Prince Eugene de Beauharnais (me) to attack Emmenhausen and throw the Allied plans into embarrassing disarray. Eugene personally thought this was all rubbish. No sane Allied commander would risk sending a half-dozen VIPs and their entourages to some crummy one-horse town in the middle of a mountain and forest region of Germany, especially one so close to the threat of enemy activity. No, one sends such vaunted people to places like Vienna, London, Stockholm or St Petersburg! Not Scummyhausen, Nowherewald, Germany. Eugene was convinced therefore that this was a trap, an elaborate ploy to invite French troops into a salient on the low ground and destroy them - more worrying was that Napoleon himself had taken the bait and ordered Eugene's corps into the lion's jaws. The Emperor must be getting senile! 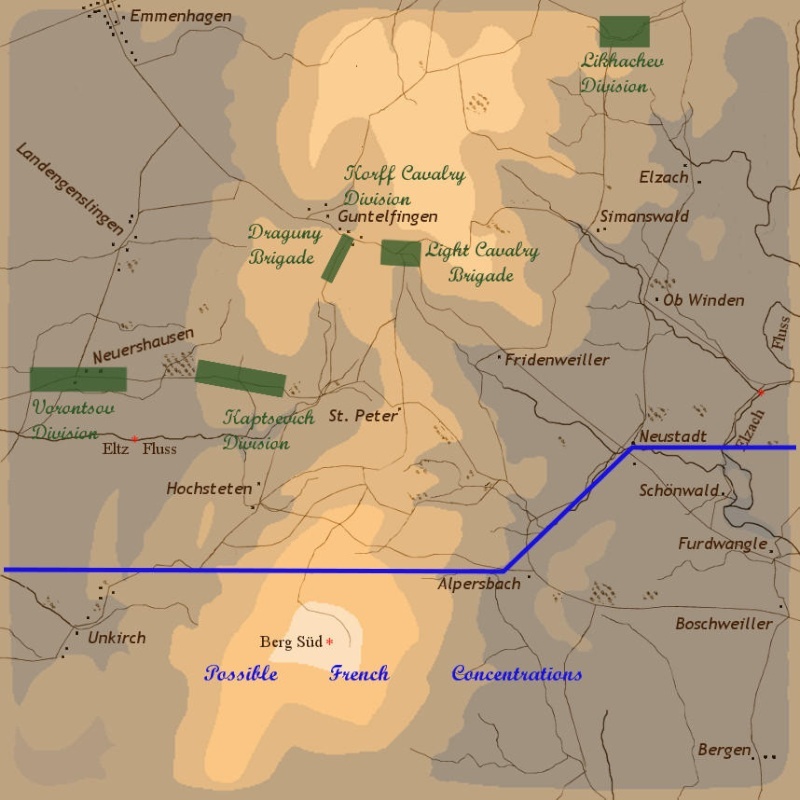 Eugene therefore drew up a plan that would be based on caution but which would pay dividends against a weak enemy force protecting Emmenhausen (such had been reported there by our scouts) while covering his position as well as he could from what was thought to be a surprise enemy attack from the north-east. Matt / Rozniecki was in command of the cavalry division. This was a very powerful formation comprising 3 brigades and a horse battery and totalling 3,300 men, including some guard cavalry, the Empress Dragoons. Macleod / Dunais (sp?) commanded the 7th Light cavalry brigade in Rozniecki's division. Kevin / Mortier had the smallest division of 4,000 men in two brigades with two batteries. Mike (Grog) / Razout had the next largest division of 5,000 men in two brigades with two batteries. Pepe / Ledru commanded the largest division of 7,000 men in two brigades with two batteries. Eugene's HQ was at Unkirch. 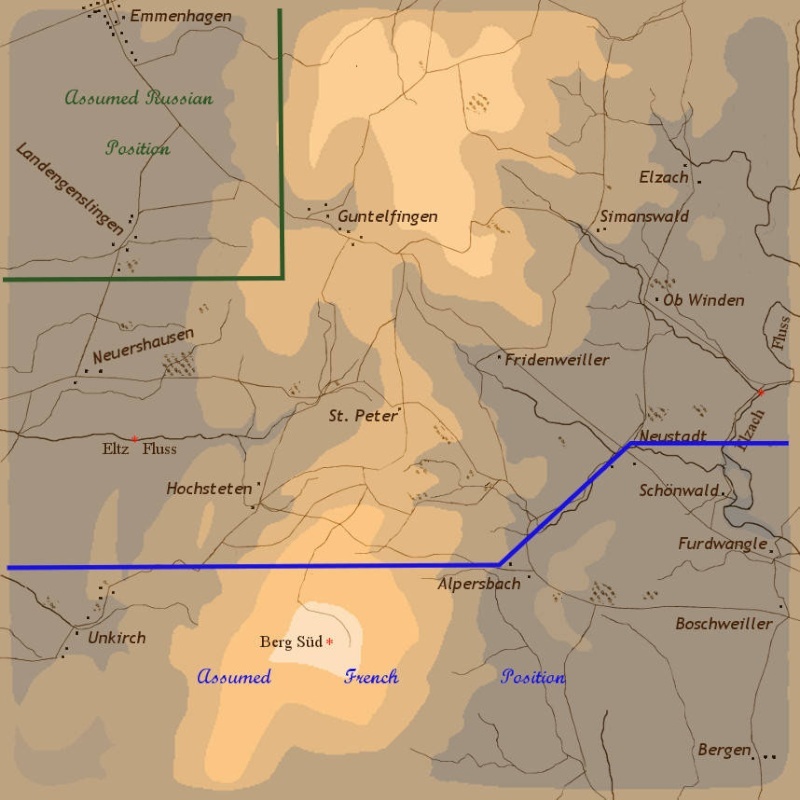 The plan was to push elements of Rozniecki's command rapidly north via Neuerhausen and Landengenslingenslagenslignen-whatever to approach Emmenhausen and report what was there. Mortier was to advance on Rozniecki's right with his right hand on the higher ground east of Neuerhausen and support Rozniecki. If there was a weak enemy at Emmenhausen as reported, these two divisions were to swing north west and crush them, then secure the town. Eugene recalled Razout at once from his out-of-position position in the far south-east. Why Razout was there was never explained. Hasn't the glorious French army had enough practice of concentrating rapidly for battle in the last 20 years? Anyway, Razout was to move to the centre of our 'column' at St Peter then form a reserve. Ledru was to push north on the spine of high ground as our right flank protection and secure the pass of Guntelfingen. This was essentially the Approach part of the plan, shown in blue. If there was no trap (and to satisfy Eugene's orders from the Emperor) the green lines then show the attack on Emmenhausen by Rozniecki and Mortier with Razout and Ledru forming supporting positions. If however this was a trap (which Eugene expected all along) then Plan Red or Plan B would be executed with all forces swinging east to take up defensive positions on the best high ground to await the enemy attack from the north east (which Eugene was convinced was coming). The march began and within a few minutes of setting off from his HQ, Eugene was advised by Rozniecki that an enemy force held Neuerhausen. Danais (sp?) and his light cavalry had hurled themselves against the enemy position without waiting for support but had some early success by capturing 5 guns from a 12 gun battery. 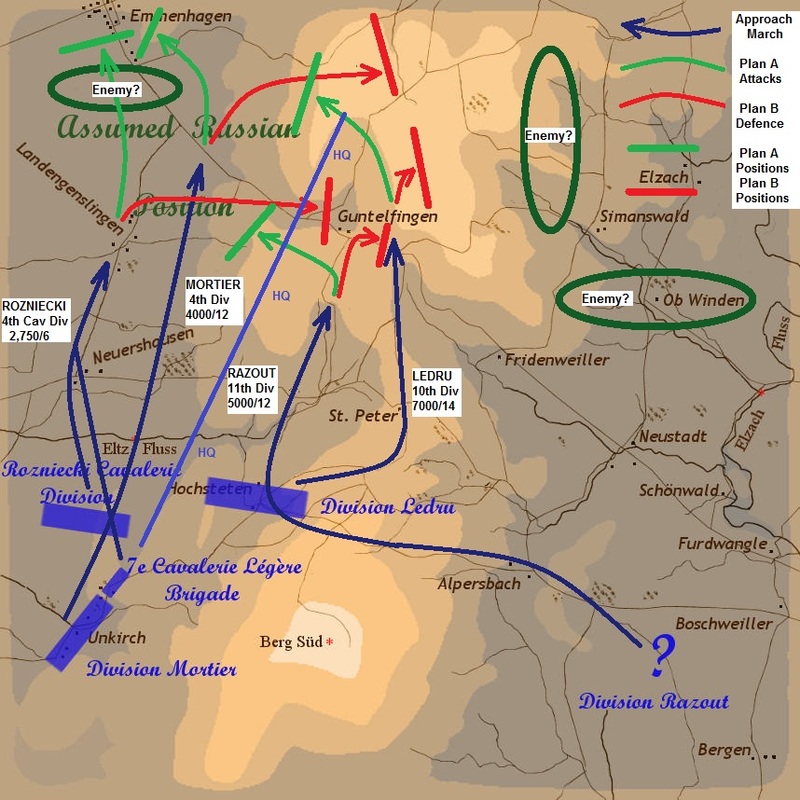 Eugene ordered Mortier up fast and told him and Rozniecki to attack the enemy at Neuerhausen and drive them back north and press on towards Emmenhausen. Eugene advised his newly appointed 'wing' commander Mortier, to be cautious, to use the superior power of his artillery and to pound the enemy before attacking. A courier then arrived from Razout advising he was at Bergen. It would take him probably at least an hour to get him to join us. Damn. Eugene then rode up the hills eastwards following a party of smartly-accoutered Russian officers who had gone off the same way! Clearly this wasn't an out of season hunting party and something was afoot in the foot hills! Prince Eugene reached the vicinity of a high ridge overlooking a valley with St Peter on the far crest to see Ledru's division advancing north as ordered but with a Russian division on the near slope (beside Eugene!) hitting his left flank. Ledru had also reported cavalry to his front. Eugene saw the danger and briskly ordered Ledru to fall back, first west and then, as his left flank was more and more compromised, south and then south-west. To Eugene's delight Ledru skilfully complied and soon the perceived danger was averted. Eugene told Ledru to hold a position on the best high ground he could as Razout was coming to support him. Eugene rode back to Neuerhausen to find Mortier still prepping the place with his artillery. Knowing that there was at least one, probably two divisions threatening Ledru in the hills Eugene ordered Mortier to attack at once and throw the enemy out of Neuerhausen with the bayonet. Eugene wanted to take pressure off Ledru and the best way to do that was expose the right flank of the Russians in the hills and force them back by pushing swiftly on Emmenhausen. From this point on in the battle (after Ledru's compromised position was saved) a certain mood fell over Eugene of complete confidence. He felt that he had the measure of his enemy and the ability to orchestrate the battle as he wished and not the other way around. It was a peculiar feeling and as an SoW player I don't think I've ever experienced it before, but from this point on I was confident of victory. Mortier and Rozniecki threw the enemy out of Neuerhausen in fine style and tumbled him north up the road to the next ridge. The Russians were tenacious in holding every piece of good ground and the terrain favoured the defence here with several streams draining westwards off the high ground forming a series of east-west ridges for the Russians to hold. Eugene sensed that the Langenslingendingledangle attack was the key to the battle and sent messages to Ledru and Razout that Razout was to pass through Ledru's position, come to Neuerhausn and assist the attack north. Ledru was ordered to hold on the high ground west of St Peter and occupy as many enemy troops as he could - if they fell back he was to push hard. If they stayed facing him he was to tease them into staying. Ledru had a very difficult job facing probably superior forces and his men had already suffered one minor setback, that Ledru performed so well and contributed so much to the subsequent victory speaks much for the quality of this officer. Eugene also owed Ledru one having been nasty to him vs the Prussians in a previous life. With Mortier and Rozniecki pressing the enemy back in the west, Macleod was ordered to take his small light cavalry brigade on a raid into Emmenhausen and wreck the party there, stealing whatever canapes and waitress madchens he could and showing our enemy how to properly crash a party. 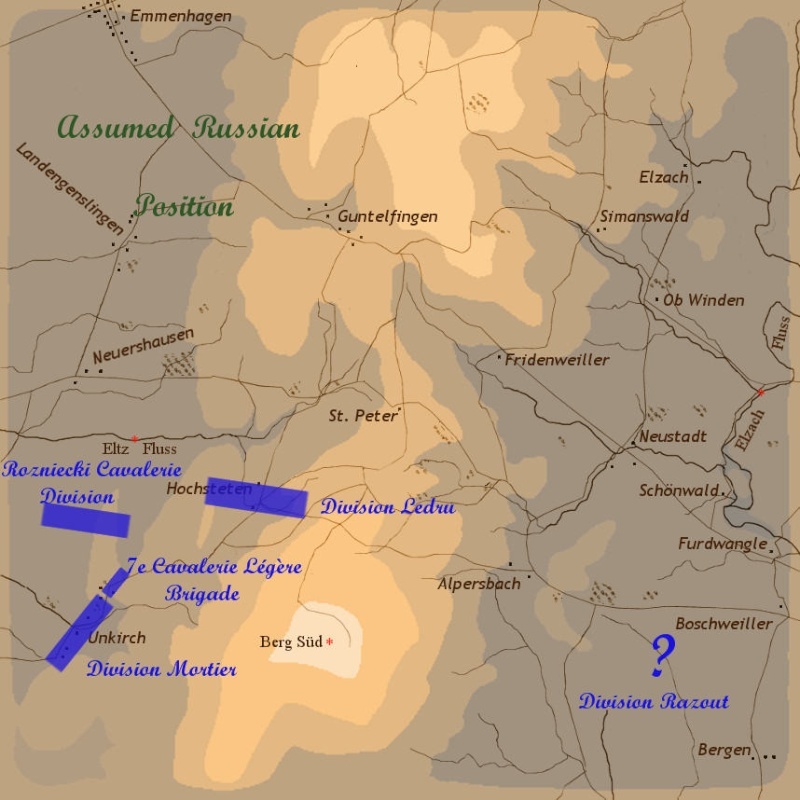 Eventually Razout arrived and was directed to attack with his division on Mortier's right, filling the gap between him and Ledru who was now advancing down out of the hills in pursuit of the Russians who were all falling back rapidly towards Emmenhausen to try and form another defence line. Eugene was having none of that and urging his division commanders on with messages of "En avant! Vive l'Empereur!" the French continued to shoot, stab and batter their way through Langenslingenwhatsit. There was a crossroads here with a brown stone house beside it on a ridge and Eugene enjoyed ordering Razout to take it with the bayonet. This was done in fine style and the Russian cavalry were finally broken at this place and the French found themselves occupying a perfect plateau of high ground with a glorious view down to Emmenhausen with all kinds of Russian units moving about below them. The battle drew into its final stage with Rozniecki-Mortier-Razout-Ledru forming a line from SW to NE and pushing hard. The French artillery was superbly handled and dominated this phase. The vaunted Russian artillery seemed to have vanished in this battle, Eugene hardly saw more than a few guns at a time. By the time 3 hours expired the enemy was at the point of collapse and on the run. Had we had 15 more minutes the town would have been ours and we at least showed the Allied big-heads that the French army is still not to be underestimated. A fantastic battle and one of my most enjoyable to date. Thanks to everyone for such superb play and to Kevin for the (evil) scenario. On my way out of town, so there is no time for a detailed account of the Russian experience (which my courageous generals have already documented quite well anyway). I did, however, want to post our pre-battle briefing documentation which, strangely, remained more-or-less intact through the course of the day, albeit with the obvious adjustments west as the French plan unfolded. Another first: Both sides left the field with legitimate claims of success. My division of Russians started well off to the east. My orders were to march southwest and hook up with Martin near Guntelfingen. As soon as the battle started, I heard guns opening up to my west. I thought about marching straight to Emmenhagen but decided to follow my orders. As I neared Guntelfingen, I saw French infantry on the ridge in front of Martin and Hays' cavalry moving to hit their flank as they pressed Martin. I set my guns and ordered the infantry due west to take the French in the flank. Fortunately for the French, they quickly called off the foolish attack and started moving southwest to get away from my infantry. We pursued hard and shot up a few battalions as they hurried away. Martin came up on my right and together we pressed the enemy. The French ended up at the bottom of the valley in perfect position to receive our canister. Our guns were giving them hell. Then I received a courier from Ron ordering me back to the second line of defense, that Mark would need support and that he (Ron) had ordered Martin to move to Mark's left. I hated leaving our excellent position, but I could see the French starting to head northwest. So I formed up my division and headed northwest as well. Martin had headed more north than northwest, so I ended up closer to Mark. I informed Ron that I would form up on Mark's left and that Martin should hold the left flank. Ron confirmed and I started getting into position to assist Mark. That's when things started to crumble. I had sent my artillery well behind my lines for safety as I began ordering battalions into position. Then I saw a few French squadrons of cavalry harassing my guns. They must have been somewhat spent as they were only able to capture two of my twelve guns. However, they also ran over and killed my battery commander. My remaining ten guns were so shook up they began retreating in different directions. My battery commander spawned some miles behind the French line, rendering my guns useless. It took me an hour to gather them in one place and get them facing the right direction, on the ridge southeast of the objective. They finally began firing as the battle ended. While I was scrambling to get my guns moving, I noticed Martin's division marching behind me, no longer on my left. I was trying to get in a position to help Mark stop the French masses. But Martin's leaving my left unnerved me. The French division to my front left, the one I expected Martin to hold off, began moving forward. I informed Ron I had to abandon Mark's left in order to prevent a whole French division from turning my flank and that he should send Martin to Mark's left. So once again, Martin and I traded places. I moved my division back and to our left, setting up a final line near the objective. The French were taking their time, bringing up their guns and pounding my poor boys who had no gun support. When the battle ended, I still had seven intact and rather strong battalions moving to protect the town. My guns were finally in position on the ridge behind them and starting to fire. I know Mark's division was pretty much destroyed. I regret not being able to support his left, but I had no choice. Had I not moved to prevent the French from flanking our left, all would have been lost. I'm not sure of Martin's division's condition. But I'm pretty sure I could have held the road going into town for quite a while. From the post game stats, it was about the same as yours, Mark. I had 6 of my 10 original battalions left. They all still had decent morale, but 5 of the 6 had suffered losses. One was totally fresh, having been ordered to garrison the objective early on, and I brought that forward to join the others for a final stand. I was given a Cavalry brigade under MJP/Matt of the glorious French, banner rich Army. My charge was to hightail it to the north and recon the enemy, as far as Emmenhausen. Within mins of moving north on our far left flank, we came upon the unwashed enemy, with Guns.... which, no.... do they appear to be vulnerable to attack ?? Mais oui !!! and so my spirited troopers road forward, thirsty for the taste of rust upon their poorly kept arty. Me, being from a highly politically placed family, obtained my commission, through other means than military training, felt justified in this headlong charge... At first, all was well. Guns were captured, silenced, glorious victory was tasted.... for a moment. We were driven off, horses tails between our horses legs... those that could sill ride. Alas, two of my units were ignominiously captured. Mon Dieu!!! I feel that the unsupported attack, although costly, might have had some positive effects, however.... or at least I hope so for the poor souls we left behind, in the unwashed hands, and in those of the All Mighty. We retreated to the far west, upon the ridge, where we could lick our horses wounds, (tasty I might add), and have a good vantage point to report upon the enemy's movements. We continued to the North, and ultimately slipped into the rear of the enemy.... we did this gently, and with lubricant, so as not to alarm the unwashed, while they were busy with our advancing troops from the south. We were able to harass and provide some discomfort to the enemy as we moved about in their rear. We moved further east with my four gallant units, until I received a strong message from my commander to "Proceed to the objective" !!!! I had to inquire to what objective was he referring, as I did not know if we were still in Objective A mode, or Objective B mode..... I was clearly tole that Emmenhausen was THE objective and I was to get there post haste !!!! We turned, galloped north, and BAM, right into every damn Unwashed horseman in the Russian Army. Terribly outnumbered, out gunned, outflanked, and out witted, we met with the horrors of war. Only two of my units remained, and we then took our leave and rode to Isengard.... oh, no... I meant Emmenhausen. Upon arrival.... there was no one at home !!!! Not a soul in the town... no Russians, no folks of any sort. So we had our way with the place... we ate, we took our rest, we drank, we relieved ourselves on the walls, we did what mischief we could... rode our horses where they should not be ridden...ultimately became bored..... we occupied Emmenhausen.... so what ? Objective accomplished.... so what. We decided we could do more damage to the enemy, than eating there food... and since there were no women in the town, we rode south, intent upon doing damage. This we were able to do !!!! Artillery.... naked, rusty, Russian Artillery.... we attacked, and dispersed, and killed commanders.... and horses, and did a fine job, until some well placed artillery rounds finished my poor souls participation in the battle, and the last I saw of them, there were riding back towards Emmenhausen, no doubt intending to look for the women that were obviously hiding somewhere in that wretched place. Its always a source of wonder and amusement how different players in the same game view their experiences! Digby wrote: Like nearly every battle I play in I record it with FRAPS. Unfortunately my PC has real trouble processing the resulting huge files and always overheats when I am converting the final win media project to an MP4. I don't know what to do about this other than upgrading my PC which for reasons of finances is out of the question for now. Diggers, Could you upload the FRAPPS file for me to download? I'm sure that the latter half of the battle would make a nice promo vid. Perhaps editing in some music, the scenario design, battle plans, replay viewer, portraits etc. It might take me a while, though. Cheers. If you send me a big flash drive in the snail mail I could mail it back to you. I don't see another way to get such huge files to you.